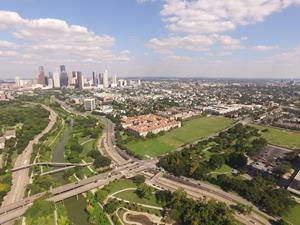 Eleven acres south of Buffalo Bayou will used for Ismaili Muslim Center. HOUSTON – (Realty News Report) – An Ismaili Muslim center is being planned for a prime 11-acre tract – once the site of Houston’s first Sears store – just west of downtown Houston near Buffalo Bayou. The Ismaili Center in Houston will serve the city’s approximately 40,000 Ismaili Muslims and is expected to include a Jamatkhana, or prayer hall, educational spaces, a social hall, and several multi-purpose meeting and conference spaces. The site, which slopes down from West Dallas Street toward the bayou, is at the southeast corner of Allen Parkway and Montrose Boulevard. The land was once the site of Houston’s first Sears store, opening in 1929. After flood waters from Buffalo Bayou inundated the store in 1935, Sears relocated to its South Main Street store in Midtown. The Allen Parkway property became a landmark art deco industrial property known as the Robinson Warehouse. In 2006, the property was purchased by the Aga Khan Foundation. Then the Robinson Warehouse was demolished, clearing the way for Ismaili Center. Although it will be several years before the center is complete, the architecture team was recently selected following a international design competition. “We are excited to be working with architects of world stature and experience to design this unique project. It will embody both Houston’s and the Ismaili community’s pluralistic vision,” said Barkat Fazal, President of the Ismaili Council for the USA. DLR Group/Westlake Reed Leskosky will collaborate with London-based design architect Farshid Moussavi on the project. Moussavi also works as an architecture professor at Harvard University. Landscape architect Nelson Byrd Woltz will work on the project, which will have courtyards and open spaces that could be impacted in times of extreme bayou flooding. The new Ismaili Center will be the seventh in a series of iconic cultural buildings His Highness the Aga Khan has commissioned over the past four decades in the United Kingdom, Canada, Portugal, United Arab Emirates, and Tajikistan. Once complete, the center will serve as a national hub for the social, cultural, and intellectual activities of the Ismaili Muslim Community.